In Science, the Year One students have been learning about light and sound. We have learnt about how sound reaches our ears through sound waves and light is a form of energy that is detected by our eyes. As a part of our Science Program, the Year One students were asked to create a sun chime to both catch the sunlight and make a pleasant sound when the wind blows. We reviewed our environment and found that the tree in the Early Childhood playground would be the perfect place for our sun chimes. The children chose their groups of three and began to plan their ideas. They sketched their design and labeled what materials they would use. We then invited some parent helpers in to help us construct our designs. Throughout the construction process, the children showed various communication, reasoning and negotiating skills to design their sun chime as a group. 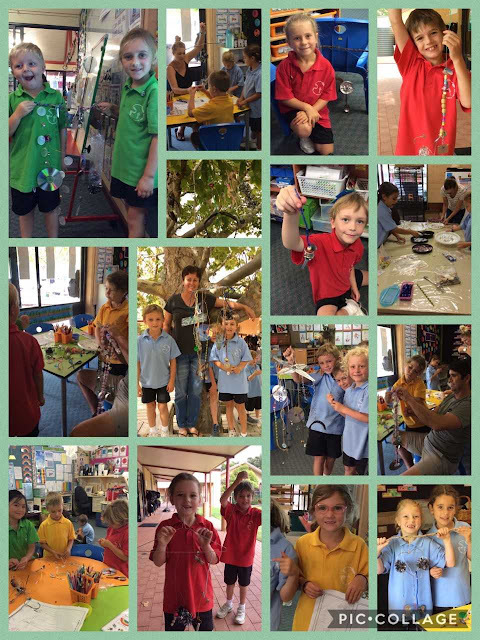 The rich conversations they engaged in to change and adapt their design created a buzz around the ECC area, which led to individual and creative sun chimes being produced. Thank you x 1000 to our outstanding parent helpers who came in to help us on Friday. You twisting, fixing, gluing and laminating skills were second to none! Another huge thank you to those lovely parents who took home very tricky shells and strung them up while your children slept. We appreciate all the parent help and could not have done it without you! Here are some of the wonderful pictures of the children creating their sun chimes.